your own flour mixture* (See recipe at end of all the recipes.) with flours of your choice to suit your dietary needs. 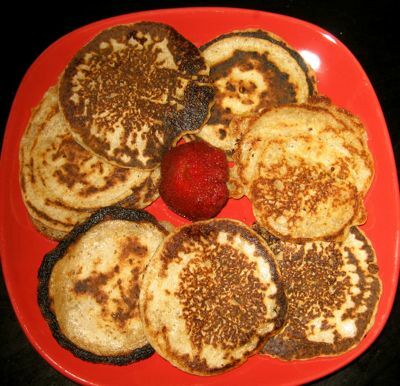 These pancakes came out very light. 1. Prepare egg substitute and set aside. and spice if using it. and brush on a little oil. of the pancakes; then flip over and cook a little longer. butter, applesauce, or jam. Makes about 6-8 three inch pancakes. or less liquid to make a pourable consistency. nuts, or sliced bananas to batter when first poured into pan. Asparagus is a harbinger of Spring, thus the title. 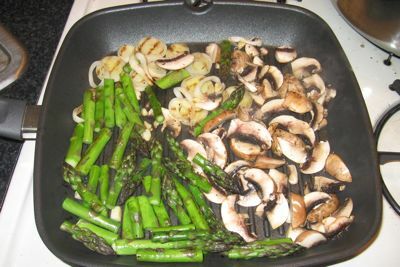 Picture of veggies in grill pan before grilling. 1. Put water up to boil, add salt, and cook pasta according to directions. Do not overcook. 2. While water is coming to a boil, prepare and grill veggies on a stove top grill pan, or saute in a 8-10 inch fry pan fry pan, or bake in oven at 350 degrees for about 10 minutes or until veggies are tender, but not overcooked. If veggies get done before pasta, set aside on a back burner without heat. 3. Before draining pasta, reserve 1/4 cup pasta water. Rinse pasta with cold water if directions indicate, and place in serving bowl. 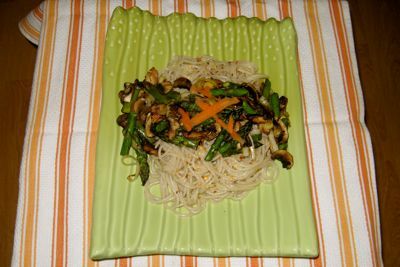 Add veggies and toss with 1 – 2 Tbl. olive oil and up to 2 Tbl. pasta water if needed. 4. Add salt & pepper to taste. Optional: Add red pepper flakes, raw carrot slices, or finely sliced, fresh basil. Serves two as a main dish with salad and a protein source, four as a side dish. Note: My daughter Basha, who went to culinary school, was my partner. She and I loved working together and it was she who suggested using her grill pan, which I had never used before. It worked great. She also suggested I use pasta shapes, like spirals, which cook better than spaghetti. Thanks, Basha. Finished pasta dish, ready to enjoy. 2. 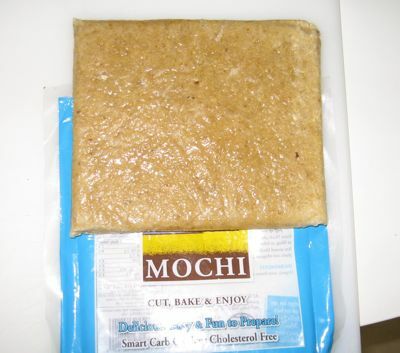 With a sharp knife, cut Mochi into 1″- 2″ squares to bake properly. 3. Place pieces at least 1″ apart on a non-stick baking sheet, since they puff up and expand. 4. Bake 8- 10 minutes until the pieces “pop” and are slightly browned on top. Enjoy it plain or with you favorite topping or filling, since as it puffs up, it creates a little pocket that can be stuffed or topped with jam, honey, or nut butters. Also can be topped or stuffed with avocado, tomatoes, beans, and used as hors d’oeuvres. The possibilities are endless and you will never miss the wheat! 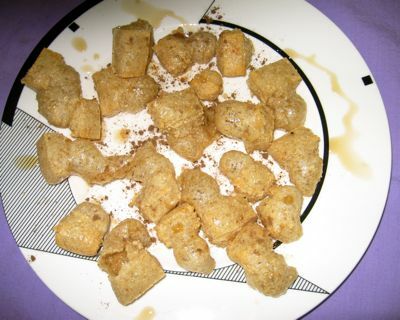 Dessert Mochi, baked and sprinkled with allspice and drizzled with maple syrup. It isn’t very photogenic, but it is tasty! *Below is one of the flour combinations from an article in Living Without magazine, reprinted with permission from the publisher. This excellent magazine was started 10 years ago by Peggy Wagener, who has celiac disease (gluten intolerance). Please go to Profiles to learn more about Peggy’s passion and the magazine. 1/4 cup nut flour. Refrigerate until used. Final Note: Just as I was working on this portion of the posting, I received a call from Great Harvest, a local bakery that makes gluten-free bread that they will ship to your home. However, their formula does contain butter and buttermilk, so it is not for anyone who is both gluten- and dairy- intolerant. The owner’s email address is: jblumenstock@greatharvest.com. I ordered one loaf of their cinnamon chip gluten-free bread for the Memorial Day week-end and will let you know how it tastes. This entry was posted on Friday, May 9th, 2008 at 2:48 am	and is filed under Kitchen Nutrition. You can follow any responses to this entry through the RSS 2.0 feed. You can skip to the end and leave a response. Pinging is currently not allowed. Can you send the recipe to put in my website and give you credit? Thank you so much for this endorsement. Since going on a gluten-free regimen, my digestive track has improved. Almost all my recipes are dairy and gluten-free and I will probably do another article before the year isout.